WEBINAR SERIES FOR ONE PRICE! In this 4-part recorded webinar series, Shayna Komar, RD, LD, and Chef Nancy Waldeck will provide you with recipes, tips, and ideas on how to use seasonal produce with the right herbs and spices. Listen and learn why great chefs and dietitians alike go to the garden to spice up their clients' kitchen! Earn 1 CEU per part! 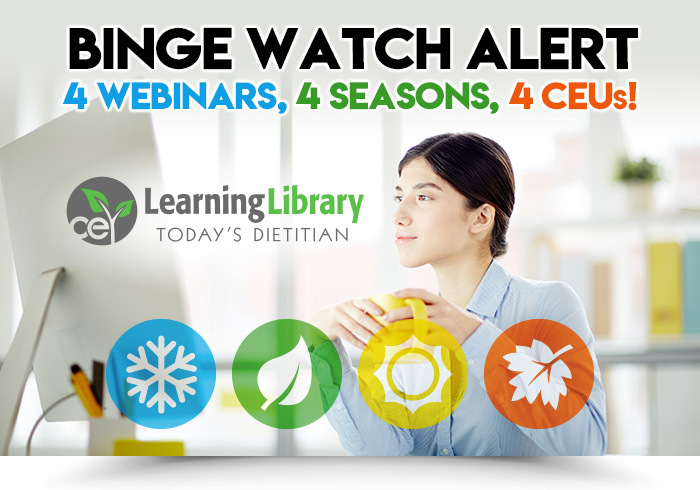 Visit CE.TodaysDietitian.com/webinars to register for all 4 seasonal webinars.